China ready to deploy elite troops in Syria to fight with Assad’s army. 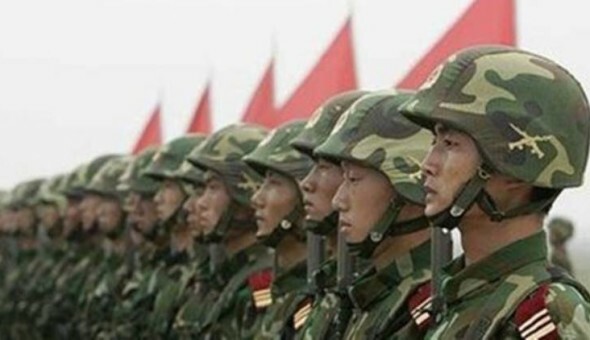 According to multiple reports China is planning to send elite military units to Syria to advise and assist the Syrian Army in an attempt to root out the country’s terrorist insurgency. A focus of the Chinese elite unit will be on Chinese Islamist foreign fighters, who have shown up in increasing numbers in Syria’s north since the start of the US/Saudi intervention in Syria. If confirmed this won’t be the first time China – one of the five veto-wielding powers of the UN Security Council – has sent assistance to the Assad government: according to previous reporting by Middle East Eye, China began quietly sending soldiers in an advisory capacity into Syria earlier this year to assist government forces in weapons systems, intelligence collection, logistics, and medicine. But this certainly marks a dramatic and more public escalation in terms of Chinese operations in the region as Beijing will reportedly send special forces to work closely with government troops, and likely in coordination with the Russians as well. Sources told the Saudi Arabia based newspaper New Khaleej that the Chinese Ministry of Defense intends to send two units known as the “Tigers of Siberia” and the “Night Tigers” – both elite special operations units – to assist the Syrian government’s fight against the jihadist insurgency. The news follows a high level meeting last week in China between Syrian Presidential Advisor Bouthaina Shaaban and Chinese Chinese Foreign Minister Wang Yi, who praised Damascus’ efforts in fighting foreign militants from the East Turkistan Islamic Movement (ETIM, also commonly called the Turkestan Islamic Party, or TIP). The Muslim separatist group was founded by ethnic Uighurs and is based in the Xinjiang province of northwest China. The militarized Uighur separatist movement has long been a thorn in the side of the Beijing government, which began actively fighting the group soon after 9/11 when reports began surfacing that notable al-Qaeda terrorists as well as Osama bin Laden himself were actively supporting Uighur extremists and their operations. Various Uighur Islamist groups have claimed terror attacks in Chinese cities over the years, most notably a Shanghai blastwhich occurred days before the 2008 Beijing Summer Olympics were set to begin. When armed opposition groups in Syria began taking territory around Aleppo and other parts of Syria’s north in 2013, thousands of Chinese Muslim foreign fighters began pouring into the war via southern Turkey. At the time this sparked a quiet diplomatic war between the Turkish and Chinese governments as Chinese intelligence demanded southern Turkey not be a staging ground for Uighur militants it was tracking, and which Chinese leaders feared. The end result was closer Chinese ties with the Syrian government based on mutual commitment to anti-terror operations and resisting the international push for regime change – a relationship which was formalized made public when in August 2016, a Chinese admiral visited Damascus to sign memorandums of understanding involving joint anti-terror operations including mechanisms to track captured Uighur fighters in Syrian prisons. Indeed, it’s no secret that throughout the course of the over 6-year long war in Syria, the international powers operating from neighboring countries – most especially Turkey – have allowed border areas to remain remarkably porous, which facilitated record breaking numbers of jihadists entering Syria from dozens of countries. As the US State Department’s own 2014 Country Report on Terrorism confirms, the rate of foreign terrorist entry into Syria over the past years has been unprecedented among any conflict in history: “The rate of foreign terrorist fighter travel to Syria – totaling more than 16,000 foreign terrorist fighters from more than 90 countries as of late December – exceeded the rate of foreign terrorist fighters who traveled to Afghanistan and Pakistan, Iraq, Yemen, or Somalia at any point in the last 20 years.” According to multiple counter-terror studies as well as diplomatic sources in Syria, up to 5,000 Chinese Uighurs and their families are currently in Syria, mostly now settled in al-Qaeda controlled Idlib province. The US State Department also considers the Uighur TIP a terrorist organization with the United States having formally designated the group all the way back in 2002. However, the US and China have long been at opposite ends of UN Security Council votes on Syria, with China consistently vetoing measures and resolutions which propose critical or punitive measures against Damascus. Since jihadist forces overtook Idlib City in 2015, the TIP became one of the strongest foreign jihadist forces in the country’s northwest. The Asian radical Islamist groups are now supporting a military operation of Hay’at Tahrir al-Sham (formerly Jabhat al-Nusra, the Syrian branch of al-Qaeda) in the northern Hama countryside, according to various reports from Syrian opposition sources. This might have encouraged China to consider more direct and aggressive military action against the TIP in Syria before its fighters gain an opportunity to return to eastern Asia.